Bob and Janice Fera captured this image of NGC 6503 over several nights in May 2013 from Eagle Ridge Observatory in Foresthill, Calif. The Feras used an Officina Stellare RC-360AST 14" f/8 Ritchey Chretien Cassegrain telescope with two-element field flattener to observe the galaxy. An Apogee Alta U16M CCD camera with Astrodon filters was used to capture the photo. The dwarf spiral galaxy NGC 6503 glows beautifully in the constellation Draco (the Dragon) in this recent night sky photo. Astrophotographers Bob and Janice Fera took this image over several nights in May 2013 from Eagle Ridge Observatory in Foresthill, Calif. 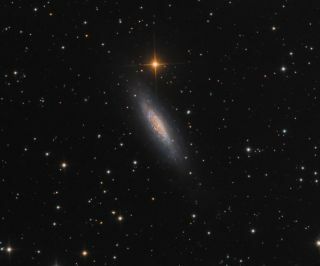 Sitting at the edge of a region called the Local Void, NGC 6503 is located about 17 million light-years away from Earth in the direction of constellation Draco. The Local Void is a large, sparsely populated area where few bright objects are found. This lonely galaxy has few neighbors, as the Void's diameter varies from 30 million to about 150 million light-years. The Feras used an Officina Stellare RC-360AST 14" f/8 Ritchey Chretien Cassegrain telescope with a two-element field flattener to observe the galaxy. An Apogee Alta U16M CCD camera with Astrodon filters was used to capture the photo.